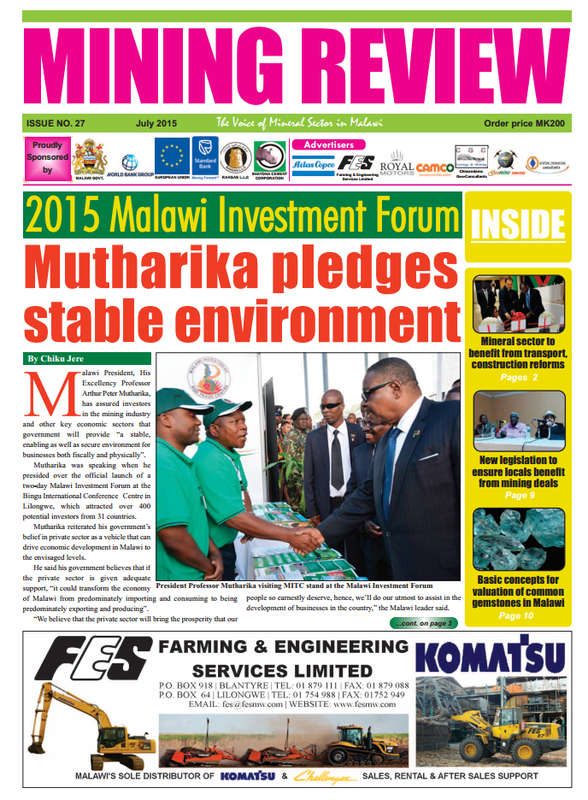 The piece “2015 Malawi Investment Forum: Mutharika Pledges Stable Environment” featured below was initially published in Malawi’s Mining Review Issue Number 27 2015 that is circulating this July 2015. Malawi President, His Excellency Professor Arthur Peter Mutharika, has assured investors in the mining industry and other key economic sectors that government will provide “a stable, enabling as well as secure environment for businesses both fiscally and physically”. Mutharika was speaking when he presided over the official launch of a two-day Malawi Investment Forum at the Bingu International Conference Centre in Lilongwe, which attracted over 400 potential investors from 31 countries. Mutharika reiterated his government’s belief in private sector as a vehicle that can drive economic development in Malawi to the envisaged levels. it could transform the economy of Malawi from predominately importing and consuming to being predominately exporting and producing. Mutharika noted that through multi-sector reforms that his government has initiated and is implementing, doing or establishing business in the country would now be much easier. He, among other interventions, mentioned the establishment of a One-Stop Service Centre at Malawi Investment and Trade Centre (MITC) which will assist investors with registration of companies, land for investment identification, employment permits and issuing of business licences. The centre will also provide information and advice to prospective investors on available investment opportunities. 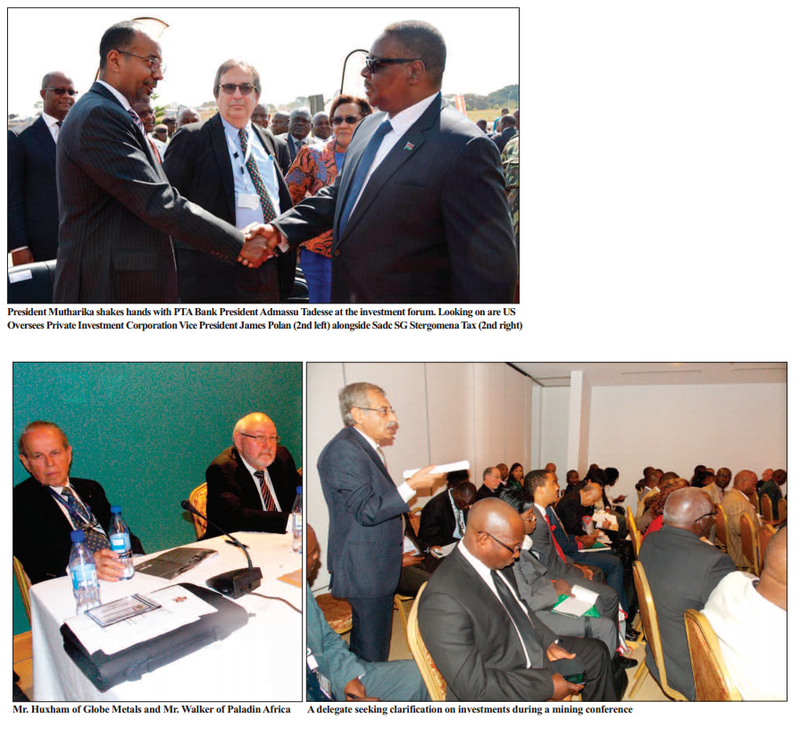 Tackling the issue of security, the Malawi leader assured foreign investors of a secure environment both on fiscal and physical fronts further promising government’s flexibility when it comes to repatriation of profits. He said the local currency, the kwacha, has been stable over a year due to the liberalisation of the exchange rate policy and promised to uphold the status quo for a foreseeable future, as a way of maintaining a stable environment for running of businesses. Mutharika also said the Government of Malawi has already embarked on projects that would result in the provision of reliable electricity supply, accessible road network, among other necessary developments that would make business operations in mining and other key economic sectors easily manageable. He cited the upgraded electricity generation capacity and the introduction of demand-stride management measures, which, he said, have resulted in the country’s electricity supply becoming increasingly reliable, with the generation capacity exceeding demand during off-peak hours. The President announced that Malawi will soon be embarking on the construction of the long awaited electricity interconnector with neighbouring Mozambique and the upgrading of national transmission network – projects which will assist the mining sector that requires reliable and adequate supply of energy for smooth and productive operations. Mutharika also observed that the upgrading of Nacala Transport Corridor, which includes construction of a railway line from Tete to Nacala cutting through Malawi, will provide fast access to the Indian Ocean in the same vein cutting transport costs for imports and exports. The President then announced that Malawi will recently become a citizen of a Tripartite Free Trade Area, a treaty which brings together 26 African countries and is aimed at boosting inter-regional trade, eventually leading to the opening up of previously unavailable investment opportunities. In his closing remarks, Mutharika took time to encourage partnership agreements between foreign and domestic investors as a way of allowing Malawians to participate in the economic development of their country. Available information indicates that Malawi is endowed with rich deposits of various valuable mineral resources that remain untapped. Among the proven mineral deposits include that of Uranium, Heavy Mineral Sands, Rare Earth, Bauxite, Niobium, Coal, Titanium, Zinc, Phosphates, Gypsum, Vermiculite, Limestone, Dimension Stone, Silica Sand, Sulphides, Precious and Semi-Precious Stones. The country has also potential for the discovery of hydrocarbons and sizeable quantities of high value minerals including gold, platinum group metals and diamonds. The forum included a conference on mining investment where Paladin Africa General Manager Gregory Walker and Globe Metals of Mining’s Neville Huxham made presentations on a private sector perspective. ← One year of the Democratic Progressive Party Government – What has it done for Malawi’s mining sector?